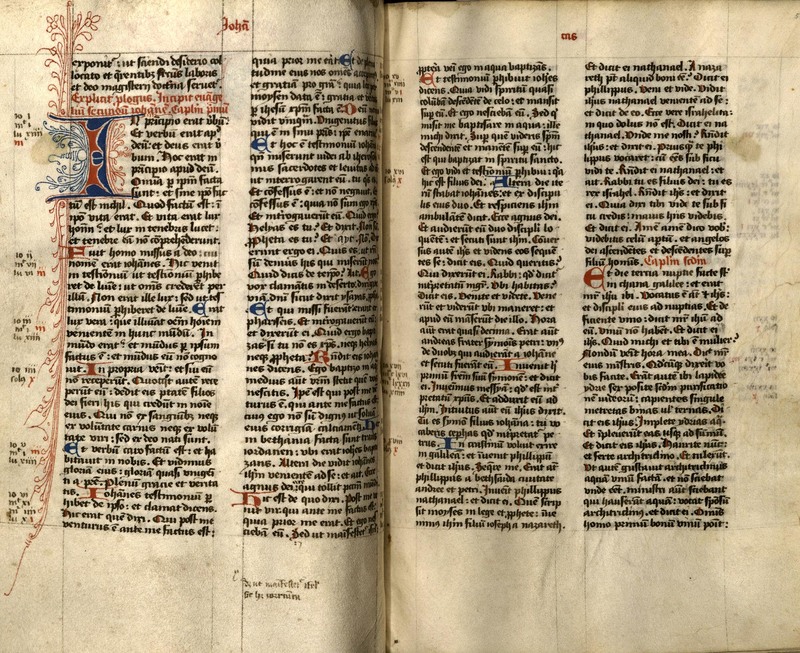 Johannes Gutenberg chose the Bible to be the first book he printed on his new printing press in Germany in the 15th century. As such, the Bible is the first mass-produced book in the world. Before the invention of the printing press, bibles and other books were written and illustrated by hand. It could take several years to produce a single book in this way, which made them very expensive. As a result, few people owned their own books, or owned only one or two that were carefully selected. Those Europeans who could afford to own a book often chose to own a copy of the Bible since it was so important to their faith. Special Collections and Archives has a handful of Christian bibles and new testaments produced in Europe during the Middle Ages by hand. 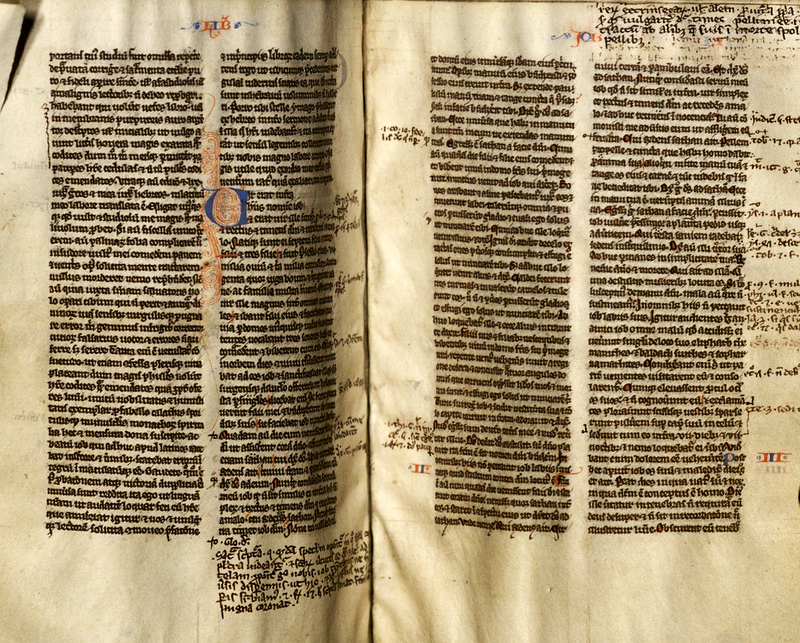 If you look closely at the pages in these manuscript bibles, you can see lines drawn around each column to help the person writing the text keep consistently-sized margins on each page. You may also notice notes in the margins and illuminated initials marking the beginning of each successive book of the Bible. The Christian biblical canon, or the list of books that constitute the Christian Bible, has developed and changed over time. In its early history, the Church sometimes convened special councils that worked to ensure the legitimacy of different books, ultimately deciding which would be included in the Bible and which would not. Perhaps unsurprisingly, members of other religious faiths that also use the Bible sometimes made different decisions about which books should be included. The Jewish Bible, for example, has 24 books, but there are 39 books in the Protestant Bible's Old Testament, 46 books in the Catholic Old Testament, and 51 in the Eastern Orthodox Old Testament. As a result of this gradual development, older bibles are sometimes missing books that are now always included. Special Collections and Archives has manuscript bibles produced in Europe in the Middle Ages, dating from two and three centuries before the Protestant Reformation. 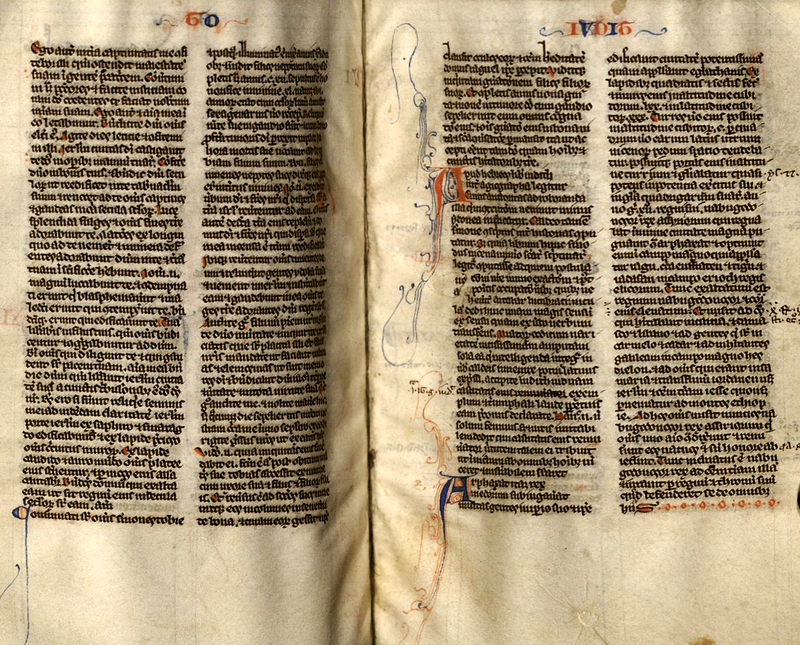 One of these, a manuscript Bible from the 13th century, was completed in approximately 1260. It is missing 1 and 2 Maccabees from the Old Testament. Both books are included in the Catholic Bible today, though they are not part of the Anglican or Protestant Bibles. 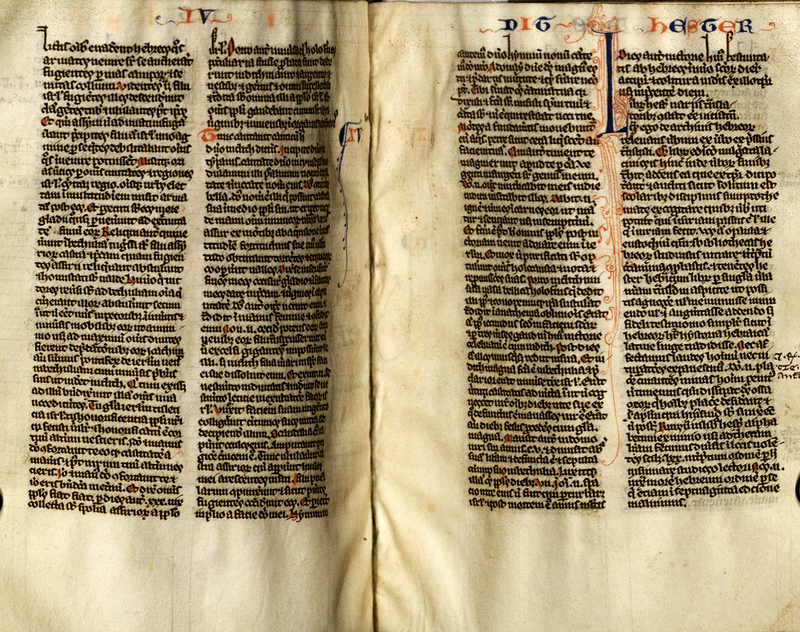 Special Collections and Archives also has a manuscript New Testament completed sometime in the 14th century. It is missing the Acts of the Apostles, which should immediately follow the four Gospels. Instead, after the conclusion of the Gospel of John, the Book of Romans immediately starts in this New Testament. 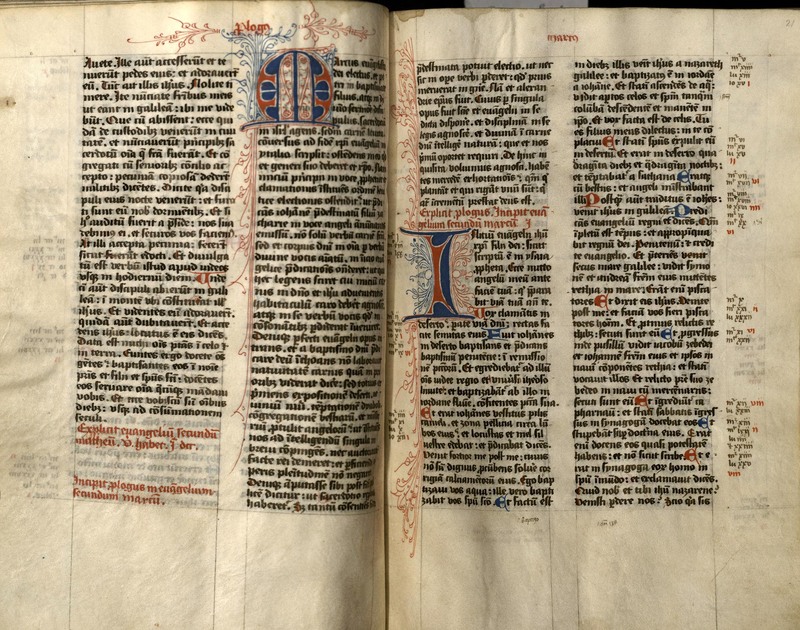 Like many books produced in Europe in the Middle Ages, both the 13th century Bible and 14th century New Testament are written in Latin. While the alphabet is very similar to our modern alphabet, the stylized, handwritten script can be difficult to read now. If you look closely you may be able to read the names of each book across the top of the pages in red and blue ink. 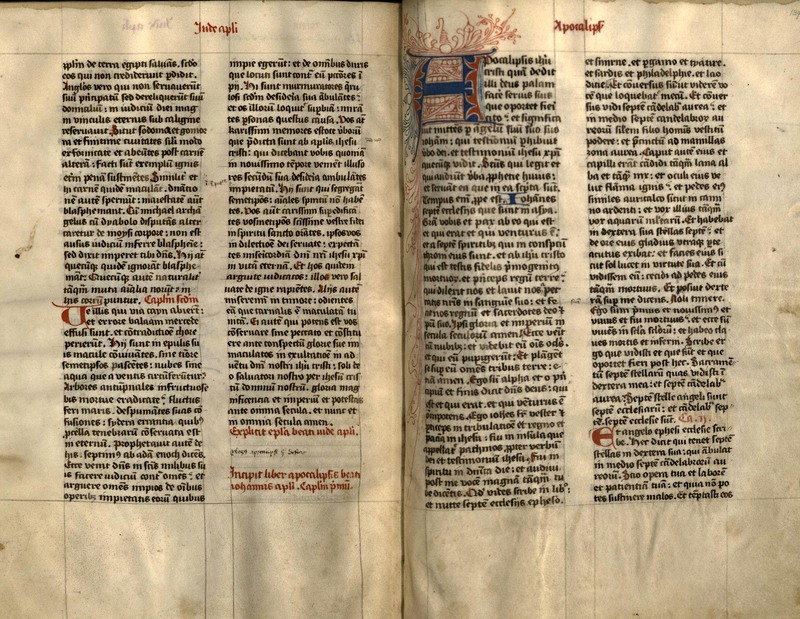 In the gallery below are images of the books of Judith, or "Iudit;" Esther, or "Hester;" and Job from the 13th century Bible. The gallery also includes images from the Gospel of John, or "Joha-nas;" the Gospel of Mark, or "Mar-cus;" and the Book of Revelation, or "Apocalips" from the 14th century New Testament.